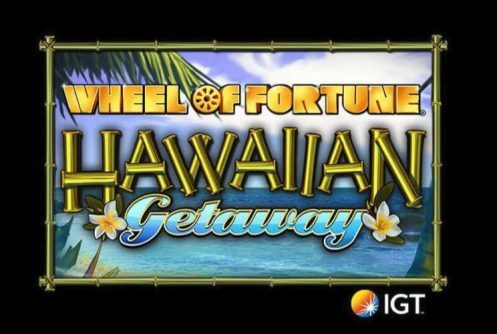 Wheel of Fortune: Hawaiian Getaway brought to you by IGT is a Online slot game based on one of the most popular game shows in U.S Television history. 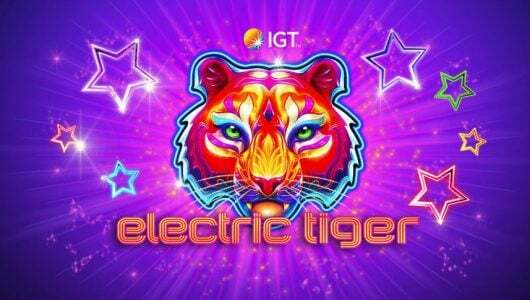 It comes with a fixed progressive jackpot that has 25 paylines, 5 reels and 3 rows, the game can now be played at all our leading IGT online casinos. In order to win additional cash prizes players must solve puzzles. The cash prizes up for grabs are determined by the giant wheel of fortune. Each segment of wedges on the wheel displays different cash prizes. The show itself is broadcasted from a live television studio to different locations across the United States. The game is very popular in Hawaii which explains the ‘Hawaiian Getaway’ bit. Even the audio track of the slots has an upbeat Hawaiian tempo to it that’s interrupted when a bunch of scatters pitch on the reels. The game window displays 5 fixed jackpots divided into purple, blue, silver, gold and green. Symbols on the reels are bamboo-ornamented, scatters, cards from J to Ace, tiles that depict a Hawaiian feature, Lava, volcano, Tiki (traditional statue), Hula (dancing girl), surfer catching a wave and the wild. The only caveat we have with the game is that the payouts for 5 of a kind symbols aren’t that great, you can expect anything from 0.20x to 0.50x your stake. 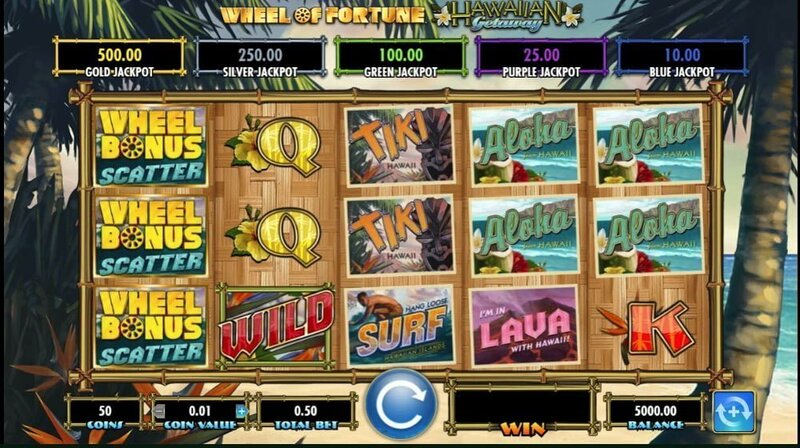 Then again it’s a different story when you land a full stack of multiple reels in the main game and when the multiplier in the ‘Big Kahuna’ feature comes into play – suffice to say the payouts will be GRAND! A bonus game is played when 6 scatters (Fortune Wheel logo) appear. Want re-spins? Not a problem, when 3 fully stacked symbols appear on successive reels a re-spin is awarded while the reels remain locked with a 3×3 symbol. Extra re-spins are doled out when full stacks land on adjacent blocks. Keep in mind that only premium symbols pitch during the re-spins as such the payouts can be huge since they come with multipliers that range from 2x to 5x! Now, if a full screen of premium symbols appear your entire screen will be transformed into a 5×3 mega symbol. When the surfer symbol extends to all 5 reels the cash prize you’ll win will be 62.5x your bet. Essentially wins can be as high as 100x your stake. The Wheel Bonus mode is triggered when at least 6 scatter appear regardless of their position on the reels. 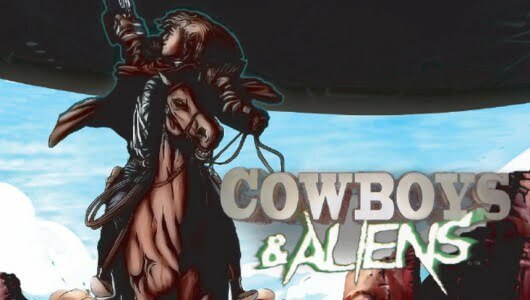 Here you can win free spins, Jackpot Bonus Wedges, coin wins and Pointer Frenzy. If you land on the Free Spins Wedge you’ll receive 10 free spins, the good news you can win up to 120 free spins because it’s a re-triggerable feature. 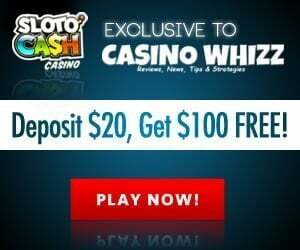 If you land on the Pointer Frenzy more pointers will be added and the Wheel will spin again, as such loads of cash prizes and multiple Jackpot Bonus Spins reign supreme here. As we like to say the 5 fixed jackpot is the business end of the slots, you’ll see all of them above the reels. When the Bonus Wheel stops on a wedge you’ll enter the Jackpot Bonus Wheel. However, it can also be triggered via the Pointer Frenzy feature where players can gain multiple spins on the Jackpot Wheel. Once played one spin on the Jackpot Wheel will be awarded as well. The wheels wedges are divided into Silver, Gold, Purple, Green and Blue jackpots, payouts can be anything from 20x to 1,000x your stake. What makes it even more spectacular is that there are no empty wedges on the wheel guaranteeing you at least one jackpot win. 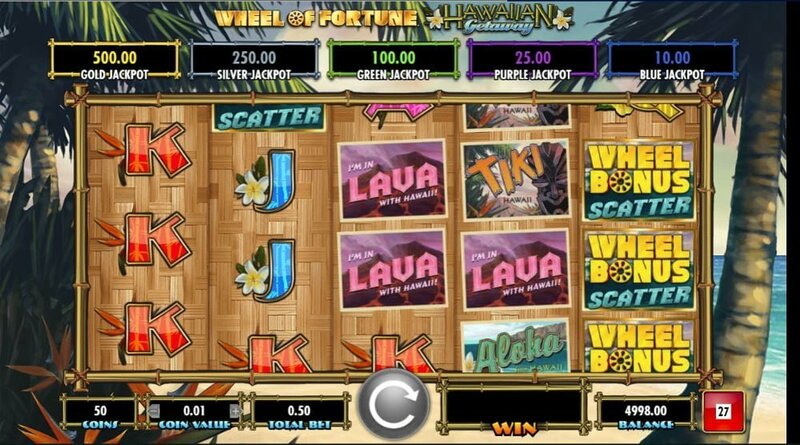 In the grander scheme of things the Wheel of Fortune slots series is a major hit for IGT and its newest installment, Wheel of Fortune: Hawaiian Getaway is no different. It’s packed to the rafters with in-play bonus rounds that include re-spins, free spins with multipliers and a Jackpot Bonus feature for that ultimate win…the progressive jackpot. As a side note, wins during the main game are so-so. Will we stick a pin in it, absolutely!